) later on. If you take care in the construction, you’ll actually be left with a very usable mask that you’ll be able to wear – kids love these and will want to show off with all of their friends. The whole project takes just a couple of days and is a fun one to do with a group of kids because they will be instantly drawn into sharing their masks with each other. Now let’s get to it! Paint and small paint brushes. Somewhere you can make a big mess! Begin by making a mixture of 3 parts glue to 1 part water and mix thoroughly. Using your large brush, dip it into the mixture and brush over a sheet of newspaper until it is thoroughly moistened. Place a second sheet on top of the first and repeat brushing the mache mix on the new sheet. Repeat the process with a third sheet and wait until all three have somewhat dried. Cut your plastic bag in half so that it is just one layer of plastic and place it over your face (be careful! plastic bags can be extremely hazardous if not properly supervised). Take yours multi-layered newspaper-mache hybrid and place it over the bag that is covering your face, molding it to the contours of your bone structure. You should now have a shape vaguely resembling your face. Continue adding newspaper layers to the face with your paper mache mixture, this time by slice the news paper into smaller pieces and adding them on one at a time, taking care to allow proper drying in between. 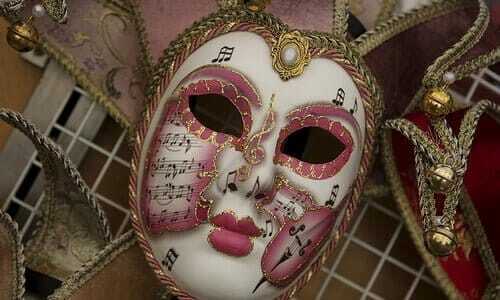 Paint your mask and let it dry – enjoy.